Russell and I spent part of our meeting this week discussing whether or not Tiktaalik would have had a nictitating membrane on its eyes. "Modern amphibians, as well as many other, more advanced tetrapods, have a nictitating membrane, a translucent third eyelid that can protect the eye without obscuring vision (the lineage that culminated in Homo sapiens lost the nictitating membrane – what a pity! I want one…). Ichthyostega is close to the ancestors of modern amphibians, so it would have had the nictitating membrane. Now, of course, we’ve found lots of other fossils that bridge the gap between Panderichthys and Ichthyostega. From most basal to most advanced the sequence goes: Lungfish > Eusthenopteron > Panderichthys > Tiktaalik > Elginerpeton > Ventastega/Metaxygnathus > Acanthostega > Ichthyostega. (Of course, all of these taxa except for the lungfish are too late in geological time for this sequence to be a literal, linear genealogy, but they do accurately represent the various anatomical grades that would have led to Ichthyostega.) Somewhere along this sequence the nictitating membrane appeared. Lungfish do not possess it, and it’s not likely that Eusthenopteron, with its laterally directed eyes, did either, but from Panderichthys on, these animals tend to have more flattened heads and eyes on top of the skull, more like modern amphibians. This certainly implies that they were spending a significant amount of time with the top of the head exposed to the air. I don’t think there’s any reason that Tiktaalik couldn’t have had a translucent third eyelid." 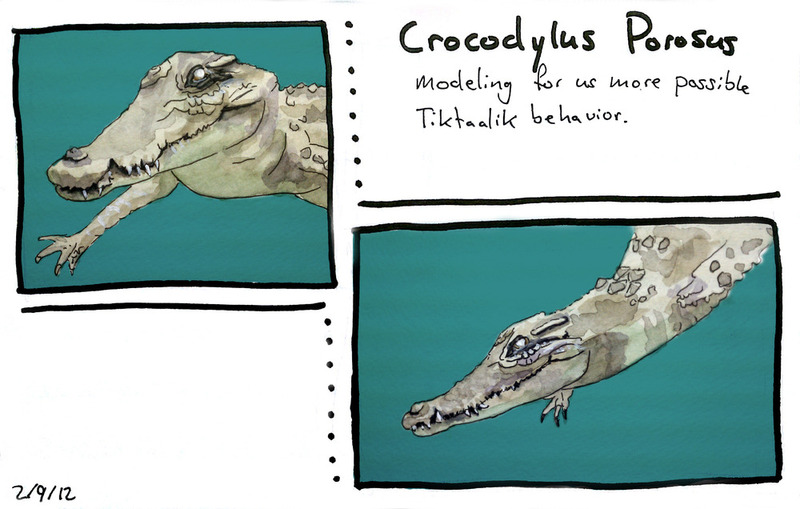 Therefore, matching the reference images we have of saltwater crocodiles underwater, we've decided to keep Tiktaalik's eyes white (at least underwater). Besides, it looks nice and creepy for our antagonist.